Our right and left hands are not created equal; at least in the world of acoustic guitars. Let’s be honest — shopping around for the best left-handed acoustic guitar is not as easy as finding the best right-handed guitar. Most regular guitars are best suited for the right hand. While there are tons of acoustic guitars on the market for the left-handed, the options are not as many. 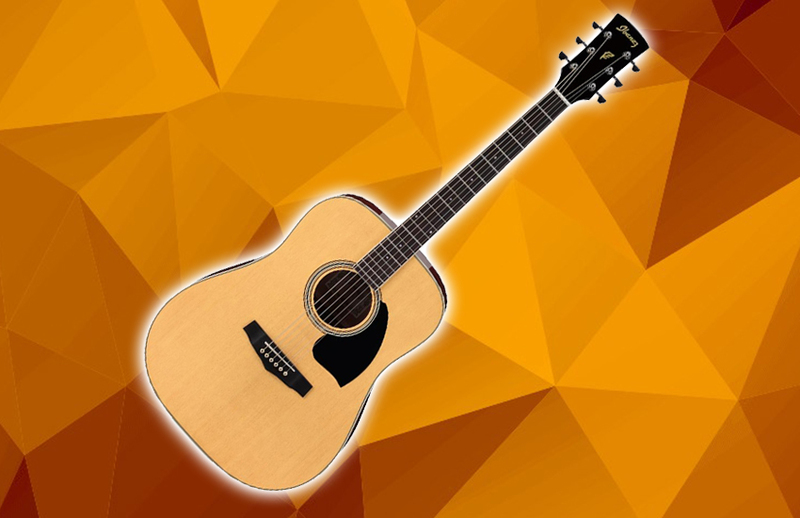 The Ibanez PF15L is a widely admired acoustic guitar for the left-handed. Today we are looking at this entry level guitar and what makes it different among other acoustic guitars for left hands. Or, is it really different anyway? Check it out. Let’s get straight to the point. 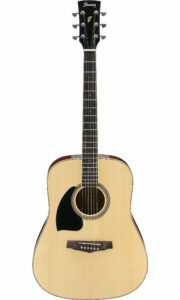 The Ibanez PF15L is not really so different from other entry-level acoustic guitars on the market. It features a traditional dreadnought body shape. 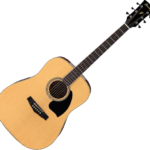 It is made of basic materials and components that you often find in most low-end acoustic guitars in this price range. The top is made from laminated spruce, the back and sides are made from laminated sapele, while the neck is made from mahogany. Everything from the bottom to the top is covered in a gloss finish. The fingerboard and bridge are both made from New Zealand pine. The fretboard has a basic set of 20 frets. On the headstock, you can find the standard die-cast chrome tuners. However, the fingerboard might be thicker, hence, more cumbersome to grip for players with smaller hands. We suggest trying it out first in flesh before making a decision. Having a set of Ibanez’s own bridge pins, they may be the only thing unique about this guitar compared to its non-Ibanez counterparts. Ibanez’s bridge pins are easier to take out and put in that you will not have to see a luthier or guitar technician have your strings removed or replaced. In terms of sound, the Ibanez PF15L delivers a decent performance. There is an abundance of natural projection and resonance mainly due to the dreadnought body shape and the spruce top and sapele back and sides. It makes the tone warmer. Meanwhile, the bracing keeps it clearer and more defined. The Verdict: Should You Buy Ibanez PF15L? The Ibanez PF15L is not the best acoustic guitar in terms of the build, that is for certain. But you can’t take away the merit from it being a low cost, entry-level acoustic guitar that is capable of producing great sound. Opinions may vary for though, depending on who you are going to talk to. 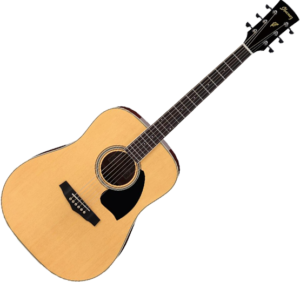 If your main concern is if it gets the job done as an acoustic guitar for the left-handed, then, by all means, the Ibanez PF15L is not a bad option at all. Overall, you get the value for your money.